No matter what future you see ahead for your accounts payable (AP) organization, one thing is sure: If your organization is going to succeed in the emerging digital trade and commerce environment, it will need to process transactions more efficiently than ever, have faster access to AP information, and be able to act upon information and identify opportunities more quickly. This will require AP organizations to transform their processes with digital technologies. Accounts payable departments that delay their digital transformation initiatives risk falling behind their peers and putting their business at a competitive disadvantage in the global business landscape. 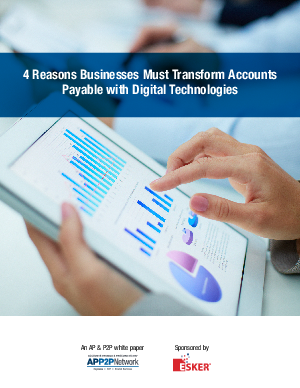 This white paper details the growth of digital technologies, the dangers of relying on manual and semi-automated AP payable processes, the benefits of using digital technologies in AP, and how effective change management ensures the success of digital transformation efforts.